The self-organized formation of clusters on Si surfaces is studied for a variety of cluster materials. In particular the Si(111)7x7 surface often acts as a template, where the 7x7 periodicity is maintained during cluster formation, so that regular arrays of magic clusters may be formed. For the case of Sb, ringlike clusters are found which appear with different heights in the STM images. This behavior can be explained by a fundamental structure model where Si atoms are substituted by Sb atoms, in analogy to semiconductor doping . For the case of Dy, both centered and off-center clusters are observed, and the atomic structure of the off-center clusters could be determined . This work is currently supported by FOR 1282 project D of the Deutsche Forschungsgemeinschaft. STM overview image (top) of ringlike Sb clusters on the Si(111)7x7 surface, appearing in different heights, and detailed image with structure model (bottom). The different heights are related to substitution of some Si atoms (grey) by Sb atoms (pink) . STM overview image (left) of centered (blue) and off-center (green) Dy silicide clusters on the Si(111)7x7 surface, and detailed image of an off-center cluster with overlaid structure model (right) . 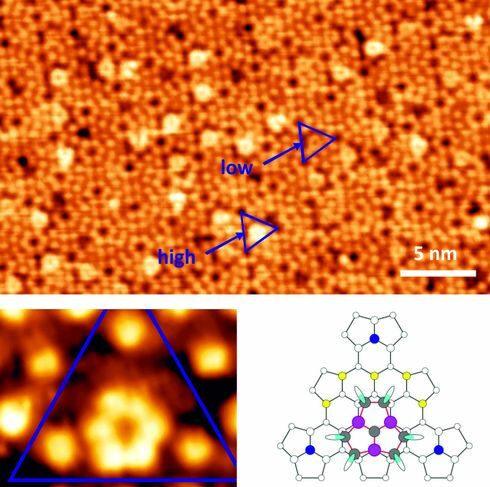 Antimony induced cluster formation on the Si(111)7×7 surface, S. Appelfeller, M. Franz, and M. Dähne, Surf. Sci. 608, 109 (2013). Formation and atomic structure of self-assembled Dy silicide clusters on the Si(111)-7x7 surface, M. Franz, S. Appelfeller, M. Rychetsky, and M. Dähne, Surf. Sci. 609, 215 (2013).